Erik James Montgomery is a fine art photographer who creates relevant, thought-provoking, visually unique imagery. He grew up in the inner city of East Orange, New Jersey where many of his peers fell into the traps of crime, drugs, self-hate, and unemployment. Determined not to become a statistic but an over-comer, Erik chose to delve into various genres of art including illustrations, graffiti and eventually photography. In 2011, Erik founded The Erik James Montgomery Foundation. 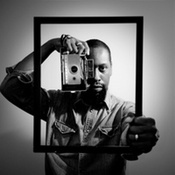 The EJM Foundation is dedicated to instructing at-risk youth in the artistic development of professional photography. His students learn the fundamentals of the craft as well as being introduced to entrepreneurship. The Foundation also creates public works of art for impoverished neighborhoods in order to transform blight into beauty. Erik is tirelessly working on several projects including PSA's targeted at social issues, a photographic version of the Bible and several exhibits featuring his artwork. Through exhibits, photographic books, public art and various collaborations, he plans to make his impact felt for generations to come. Erik James Montgomery says, "Photography is a powerful form of communication for me because it transcends all the barriers of language. I am able to speak to anyone in the world, about their world, in order to change the world."